Perennial herb from a taproot with a stem-base clothed with some brown decaying leaf bases; stems curved to erect, simple, bowed, sparsely to densely stiff-hairy, 6-35 cm tall. Basal leaves 4-12 cm long, the stalks one-half to three-quarter the leaf length, deeply dissected into elongate or egg-shaped segments, with 2-3 pairs of primary lateral lobes, the lobes mostly again divided, green or grey-green, smooth or sparsely white stiff-hairy; stem leaves lacking. Inflorescence of solitary flowers on erect, straight, nearly smooth to bristly-hairy, 20-30 cm stalks, buds erect, 10-18 mm long; petals 4, yellow, sometimes pinkish-tinged, 1.5-1.8 cm long. Capsules, oblong-ellipsoid, 1.2-2 cm long, 1-2.5 times longer than wide, brown bristly-hairy. Mesic to dry scree slopes and gravelly ridges in the subalpine and alpine zones; infrequent in NW BC; amphiberingian, N to AK, YT and NT; E Asia. 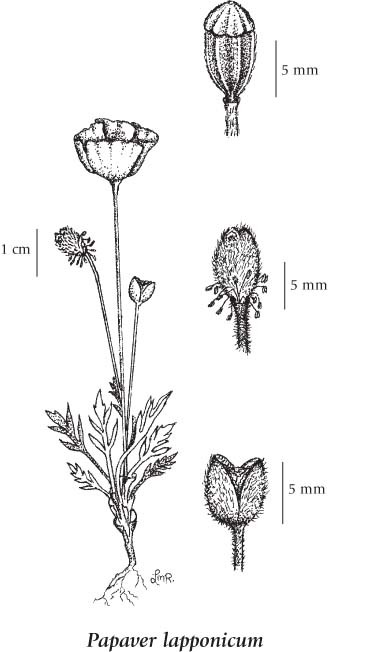 Papaver radicatum subsp. lapponicum Tolm.